Universal records are releasing three Sandy Denny solo albums (Rendezvous, Sandy & Like an old fashioned waltz) as part of their collection of Deluxe edition reissues. As we've come to expect from these Deluxe Editions, they're packed full of extra material. These new editions also coincide with a UK tour entitled “The Lady: A Homage to Sandy Denny” which will present an evening of classic songs by Sandy featuring Joan Wasser (aka Joan As Police Woman), Maddy Prior, Jerry Donahue, Dave Swarbrick, Green Gartside, PP Arnold and Thea Gilmore. 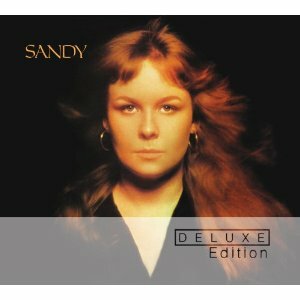 "Sandy" was released in May 1972, less than a year before Sandy Denny's death in April 1978. Since her death, Sandy Denny’s reputation has grown, largely due to this album along with "Rendezvous" and "Like an old fashioned waltz" albums (which are built mainly around her own compositions), that she is now widely regarded by many as one of Britain’s finest female singer songwriter. On this album, "Quiet joys of brotherhood" is an A Capella song, and really shows off her voice beautifully. The lyrics were written by Richard Farina and set to a traditional irish melody. The best known song on the album is "The lady", which has given its name to the tour currently happening with various performers singing Sandy Denny's songs. As always Universal have searched the archives to find a load of extra material to include with this release. It's a 2 CD package with a staggering 33 tracks in total - the 10 of the original album plus another 23. The bonus material consists of a few alternate versions of songs from the album as well as demo versions of all the songs from the album. There are also eight songs recorded live at Ebbets field in 1972 which are previously unreleased. For me, the live tracks are the best part of the bonus material as we not only get to hear the songs played live, but also Sandy's introductions to the songs. This is a great album and any Fairport Convention or Sandy Denny fans should seriously consider adding this album to their collection - with all the extra material it's a great value purchase even if someone already has the original album.